Indeed Brewing Co. beer announced plans to increase its production capacity and distribution area in response to the demand for its locally crafted beer. The expansion includes additional cellar tanks, production equipment and the hiring of additional employees at its existing 13,000-square-foot facility in northeast Minneapolis, as well as a new distribution partnership with Dahlheimer Beverage. This expansion is Indeed Brewing’s second since its founding in 2011. In January, Indeed Brewing announced a $250,000 expansion that doubled the company’s initial capacity from 3,200 barrels (bbls) to 6,400 bbls. With the new expansion, Indeed Brewing is on pace to produce 12,000 bbls in 2014, beating the company’s projections for its fifth year in business and positioning it as the sixth-largest brewery in the state. Indeed Brewing will add a set of two 60-bbl fermenters and one 60-bbl bright tank in January, followed by a matching set in April. During the summer, the brewery will add new 120-bbl tanks in an old boiler room currently being converted to house the equipment. Additional equipment purchases include a hop cannon for dry-hopping beers and a separator, which will improve the consistency and shelf-stability of Indeed Brewing’s beer. The company also anticipates the hiring of an additional brewer and three to four additional full-time staff. Indeed Brewing’s beer will reach a new segment of the fast-growing craft beer audience thanks to its new partnership with Dahlheimer Beverage. Starting Nov. 1, Dahlheimer Beverage will distribute Indeed Brewing’s beer to the outer Metro area, stretching from St. Cloud in the northwest to Mille Lacs in the north and the Wisconsin border to the east. 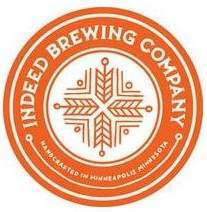 Indeed Brewing was founded in 2011 by friends Rachel Anderson, Nathan Berndt and Thomas Whisenand and is located in northeast Minneapolis. Their aim is to bring more quality craft beer to Minnesota and have fun while doing it. With the production increase, Indeed Brewing has become the fastest-growing brewery in Minnesota and is poised to become one of the 10 largest breweries in the state. As an invested member of the community, Indeed donates at least one percent of its annual sales to local and national non-profit organizations as part of One Percent for the Planet, an organization and movement that encourages corporate philanthropy for the preservation and restoration of the natural environment. Kalispell Brewing Company liked this on Facebook.